Other Family Data She had one brother, August Herzberg (b. August 3, 1885, Yokohama; d. February 17, 1947, SF). Three sisters, Mary Herzberg Staber (September 22, 1891, HK; d. March 9, 1956, Connecticut), Minna Herzberg Nantz (b. April 14, 1898, Shanghai; d. March 2, 1993, CA) and Anne Virginia Herzberg Hoffmann (b. March 29, 1901, Shanghai; d. April 13, 1977, CA) were born after she died. 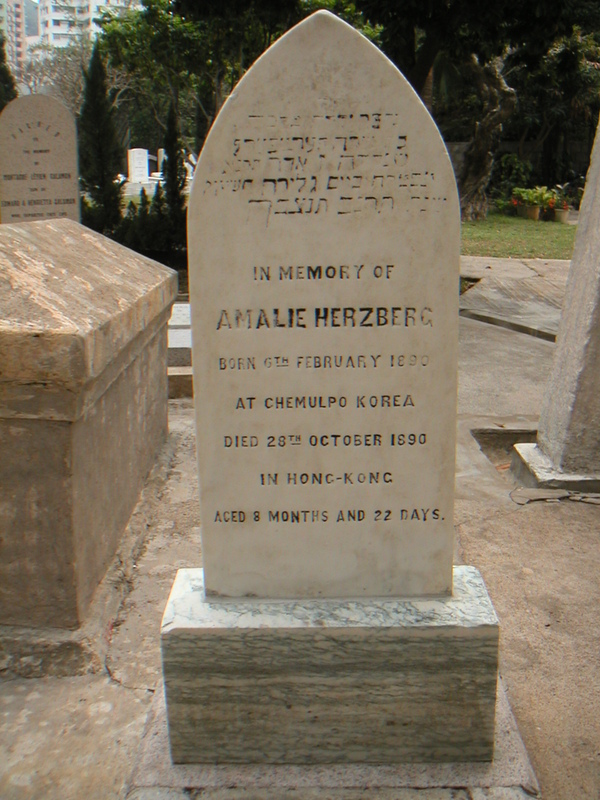 Inscription (Eng) IN MEMORY OF AMALIE HERZBERG BORN 6TH FEBRUARY 1890 AT CHEMULPO KOREA DIED 28TH OCTOBER 1890 IN HONG-KONG AGED 8 MONTHS AND 22 DAYS. Historical Chemulpo was an international port city, 25 miles southwest of Seoul, where Incheon is now. A “C. Herzberg” (most likely her father) was the second machinist on the Korean steamer “Hai Riong” in 1889 and 1890. In 1904, he is listed in a Shanghai directory as working for Arnhold, Karberg & Co. out of Hankow.